When making the model for the chocolate basket, try to have the baking parchment as smooth as possible. Creases in the paper can break the chocolate when removing the mould. 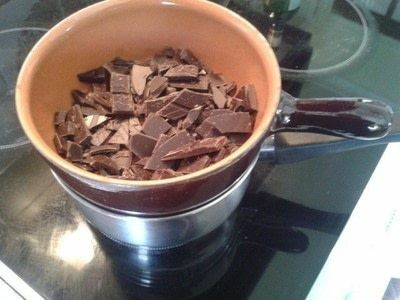 See step 6 for tips on how to remove the chocolate without breaking. Melt or temper the chocolate over a bain-marie and set aside to cool slightly so it thickens. 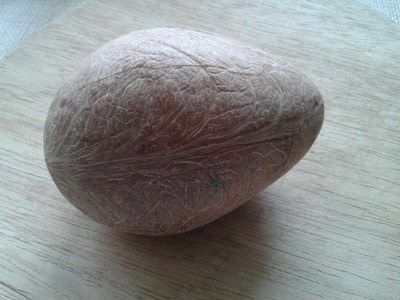 Crack the coconut shell on the pressure points until it starts to break. Carefully crack the shell so it comes off leaving the coconut whole (it will provide long strips of coconut). This is best done on the ground with a hammer. Pre-heat the oven to 150c. 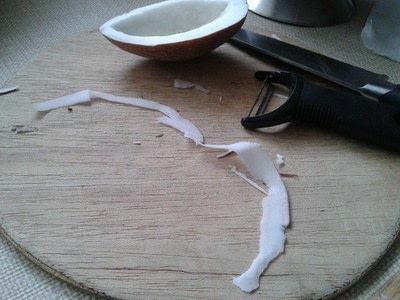 Cut the coconut in half lengthways. Then with a peeler, gentle peel around the cut edge to give a long coconut strip. Then julienne this strips of coconut and put in a sieve to wash. Once the coconut is in julienne strips, give it a wash.
Place the coconut on a tray lined with parchment. Bake in the oven, turning every 5 minutes until golden and ‘hay’ like. Check the chocolate from time to time. When it has thickened but is still spreadable it is ready to make a basket. The easiest way is to lay some clingfilm on a surface. Then wrap some baking parchment on the outside of a bowl/dish (what you will be using for the basket mould). Turn the bowl upside down and tuck the baking parchment inside. Put this on to the clingfilm and spread over a thin, even layer of chocolate. Leave aside until it starts to harden and then gentle make sure the chocolate isn’t sticking to the clingfilm. If it is pry away with a knife (as seen in the photo). Leave to harden completely. Once harden put the chocolate in the fridge for about 10 minutes to prevent the chocolate melting when you remove the baking parchment. Once cooled very gentle turn the mould upside down and carefully remove the bowl mould. 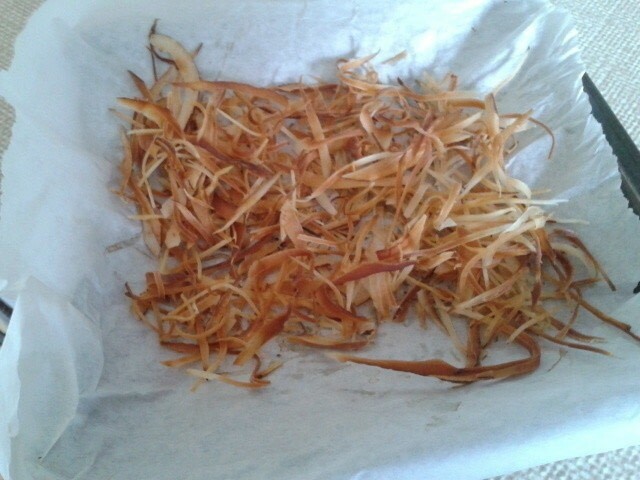 Then very gently peel away the baking parchment. 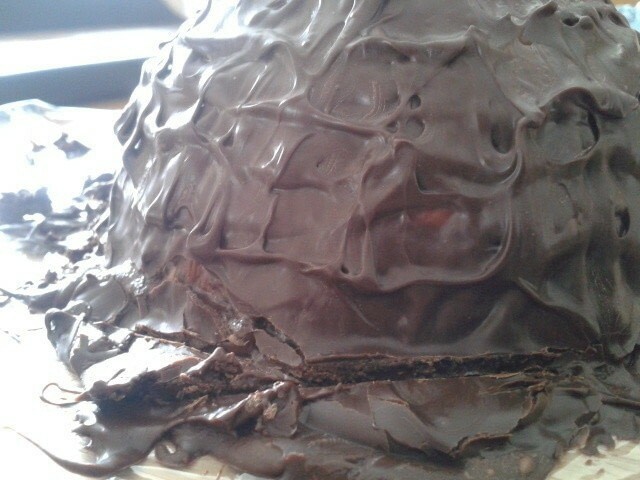 It is easiest to hold the outer shell with clingfilm with will help to prevent the chocolate from melting. If the chocolate starts to melt or feels soft pop back in the fridge for about 5 minutes. 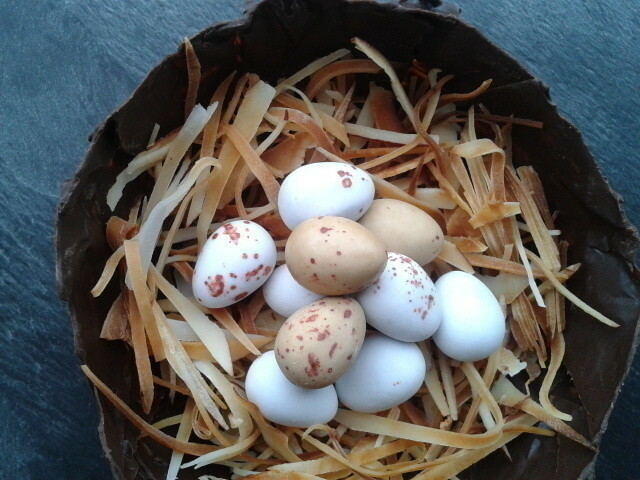 Once the parchment has been removed decorate with the coconut hay and chocolate eggs (or something else to do with Easter).